Santorini is the modern name of the island of Thera. We are here to study an ancient volcanic eruption, but being here also gives us a chance to experience some of the sights and culture of this island. That's one reason why the Immersion team has been joined this week by a group of Boys & Girls Club members from around the United States. While here they will also meet the science team on the R/V Endeavor and participate in some of the Immersion broadcasts. We are staying in Fira (pronouced FEER-a) which is the capital of Santorini. 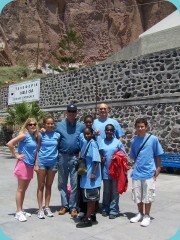 Yesterday, while the Boys & Girls Club group was on the ship, I took a walk from Fira to a town called Oia (EE-ya). Both towns sit on top of high cliffs overlooking the caldera. Along the walk, I got to see some of the eastern side of the island. Unlike the western side which overlooks steep cliffs of the caldera, the eastern side slopes gradually down to the sea. Remember that the Minoan eruption caused the center of the island to collapse into the caldera, creating these cliffs. The eastern side still shows the more gentle slope of the mountain. I started walking on a footpath that winds around the edge the caldera, through villages called Firostefani and Imerovigli. After a while I left the footpath and walked along the main road to Oia. Once in Oia, I walked down the mountain near the northen tip of the island to see a black sand beach. The sand is black because it started as volcanic rock -- hardened black lava that was worn down by the waves to form sand and smooth pebbles. What is there to eat? I took a snack with me on my walk -- a gyro (YEE-ro) which is a Greek sandwich with grilled meat wrapped in flat pita (PEE-ta) bread. I also carried a bottle of water. After exploring Oia, I was very hungry. Santorini is a popular tourist destination, so there is a wide variety of food available. There is a lot of seafood, including codfish, grilled squid and octopus. For my lunch, I choose a simple tomato salad with olive oil and a dish of yogurt and cucumber. I walked back to Fira along the footpath. Along the walk I could see the R/V Endeavor down in the caldera. The sun set around 8:30 in the evening, just as the last Immersion broadcast was ending. View more photos from my walk.